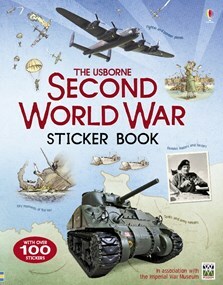 A fascinating sticker book with pages packed full of fighter planes, bombers, Allied and Axis tanks, warships, submarines and other military hardware. Includes facts, statistics, maps, true-life war stories and a short history of the war. With over 100 detailed stickers showing photographs of the equipment. Includes internet links to recommended websites to help children learn more about the war. Published in association with Imperial War Museums.